Daston Corporation is a leading provider of information technology and business management solutions to government and commercial clients. The company specializes in providing financial management and management consulting applications and Software-as-a-Service (SaaS) solutions and applications. Government work can be a feast-or-famine business where fortunes change dramatically as large contracts are won or lost. Professional services firms need the freedom to change in scale quickly, but the servers and management infrastructure that come with on-premise software do not lend themselves well to such rapid changes. In this regard, Daston Corporation was no different than thousands of other SMB government contractors. 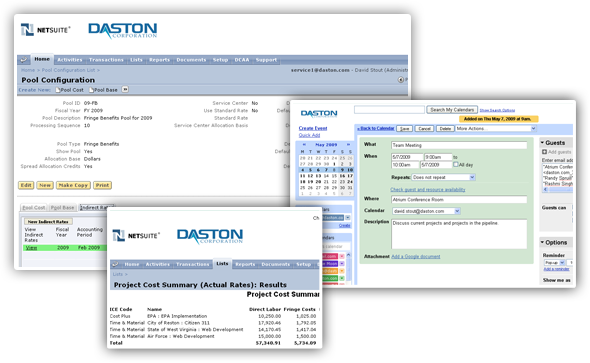 Intricate accounting and reporting requirements imposed by federal authorities can strain the boundaries of conventional SMB operations software, so as Daston grew, the company decided to standardize its operations on the flexible and extensible NetSuite platform. Daston found NetSuite to be the right choice for its growing government services business and developed customized federal compliance functionality (DCAA On Demand) using NetSuite development tools. That proved to be the beginning of a new business opportunity. With thousands of federal contractors nationwide in NetSuite’s sweet spot of mid-size businesses, Daston reasoned that many would be looking to improve the sophistication of their business operations software and would be drawn to one with top-notch federal compliance modules. The NetSuite NS-BOS development platform makes it easy for Daston to develop, test and deploy its vertical customizations without having to invest in additional hardware. Not only does NetSuite offer Daston a platform of complete enterprise resources planning (ERP), customer relationship management (CRM), and human resources (HR) functionality, but complete marketing support as well.